Ever sat through a painfully boring Bar/Bat Mitzvah service? We went to a Bat Mitzvah on Saturday at an out of town synagogue. I know it’s a different denomination of Judaism – but others have felt the same at Reform Temples too – so trust me when I say that it compels me to write that I am still reeling from the experience. I respect history, culture, tradition, etc. I know that traditions are important…. As we leave, my son tells me that sitting in that room is worse than torture. I can’t disagree. In a world of electronic stimulation, and much more, that service was as close to torture as you can possibly get. Modern religion has lost touch with any semblance of something compelling, interesting, or worse, any sense of taking home something valuable. If the only lesson to be learned is that there is a place AFTER, three hours of sheer boredom doesn’t compel many to want to hear about it. Good news – our Congregation has an amazing sales proposition in comparison with that type of synagogue offering. Our services have actual Real Live people who discuss interesting, current events and relate them to history. We walk away feeling energized – not exhausted, enriched by something of value, and possessing a sense of purpose, direction, clarity, and confidence. Just thought I would rant and share. What does it take to make the Bar/Bat Mitzvah experiences meaningful to the teens and to the adults? Have we descended into ritualism that the service is not meaningful to most worshippers, except perhaps for the symbolic passing down of the Torah, parent speeches, the kid’s D’var Torah, or participation in an aliyah? 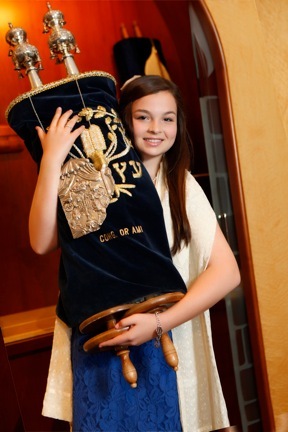 Besides one’s own loved one’s Bar/Bat Mitzvah service, what has inspired you at other Bar/Bat Mitzvah services? I’m interested, really, in your insights. Please share. In a world that teaches us its all about being happy, Torah says that we should strive to be holy. In a world that teaches us that its all about making a buck, about getting rich, Torah says that money is okay, but we have been given what we have in order to help enrich the lives of others. And in a world that teaches us that its all about me, that I can do what I want, Torah comes to teach us that we were put on this earth for a higher purpose, to transform it, into a place filled with emet (truth) and tzedek (justice), to fill it with ahava (love), so that it will become a place of shalom (peace). Self interest, making money, seeking happiness – these are all positives within the Jewish mindset. But they are not enough. As partners with God, we seek higher purpose. We call that “holiness” or “kedusha“. Some call it “finding meaning”. “Happiness without meaning characterizes a relatively shallow, self-absorbed or even selfish life, in which things go well, needs and desire are easily satisfied, and difficult or taxing entanglements are avoided,” the authors write [emphasis mine]. How do the happy life and the meaningful life differ? Happiness, they found, is about feeling good. Specifically, the researchers found that people who are happy tend to think that life is easy, they are in good physical health, and they are able to buy the things that they need and want. Torah, with its focus on helping others, reaching out to the vulnerable and the stranger, moves us from being inward focused to being other focused. We assume responsibility for transforming the world and thereby transform ourselves (thus tikkun olam encompasses and leads to tikkun atzmi). May our work on this earth, in this life, lead us toward meaning and purpose, so that in relationship with others and our world, we can deepen our lives and ennoble our souls. “Rabbi,” the mother asked, “You officiate at so many Bar and Bat Mitzvah services each year. How are you still able to make each one feel special and the most important at the moment?” I smiled at the question, which I am asked at least a dozen times a year. Motioning her to step closer, I whispered my secret: It’s not about surviving 54 services, but about kvelling for each kid. While meeting with each student for 5-7 sessions, I seek out the unique path she is on, and try – with meaningful Jewish assistance – to ease her journey toward positive Jewish identity and maturation. Said more plainly, Having gotten to know each kid, I schepp nachas (fill up with love and pride) as the child grows up and shines forth on the bimah. The parents and grandparents think they alone are going to burst with unique joy and pride, when their kinderlach (children) lead services, chant from Torah and teach us through their d’var Torah (speech). Here’s the truth: There is such joy in watching a young person grow up right before my eyes, shining from the bimah as he/she takes these first steps into Jewish adulthood. Rachel Harris, a confident, thoughtful young woman, stood up on our bimah before a sanctuary filled with her relatives and friends. She delivered her d’var Torah on topics which most thirteen year olds wouldn’t touch with a ten foot pole. Speaking on Tazria (Lev. 12:1-8 and 13:1-5), Rachel spoke about ritual purity, childbirth and menstruation. She tackles the intersection of Torah and tradition with women’s bodies and their health. My Torah portion discusses the responsibilities women have once they give birth. In the ancient world, at childbirth, women were considered ritually unclean. Therefore she had to be separated from her family and group for a certain period of time until she became ritually pure again. A woman who gave birth to a boy was separated for 40 days, while one who gave birth to a girl was separated for 80 days. Rabbi Kipnes and I discussed why women were separated for double the time after the birth of a girl. We concluded that because baby girls would eventually would undergo the same circumstances as their mother, namely menstruating and giving birth, maybe the women had more time to become ritually pure again. I do not think that the separation of women is right. Childbirth and menstruation should not be looked down upon or consider “dirty” or “unnatural.” All life reproduces. These body actions are something that all living species go through. The Jewish tradition should have consideration for the difficult biological processes that women go through. Women should receive help to go through the process. Instead, we should help them through childbirth and help them cherish this moment of birthing. My Torah portion relates to my life because someday I will go through the certain natural biological processes that almost every woman goes through. Through these experiences I will gain more responsibility and will wrestle with the new challenges that come my way. The Torah also teaches that we Jews and the much of the world as a whole have come a long way because now giving birth is not seen as disgusting but as a joyous moment. We celebrate when another human being is brought into the world and when someone is becoming a woman. In our lives today, unlike during the time of the ancient Israelite people, we believe that everyone is equal. People should not be separated for how they look or what is going on with them. Nothing should cause someone to be secluded from the people they care about; not one’s race, sexuality, religious preference, biological processes, or interests. It is important to teach my understanding about this Torah portion because it is necessary to show how we Jews and how we human beings have changed over time. It is also important because I feel that while some may think that this portion could only be thought of in one way, there are many different valid interpretations. I feel that my Torah portion connects to me in that it says that I need to be responsible. Now that I am a Bat Mitzvah, I have new responsibilities and obligations in becoming a woman. I have to take care of my own things and look out for my belongings. I have to be responsible for my own actions, what I do, and what I say. Quite impressive for a 13 year old young woman. Quite courageous for a teen standing before a crowd of her classmates. Moments like these – and I find one at every Bar and Bat Mitzvah with every student – fill me with hope for the Jewish future. Mazel tov to Rachel and her mom Jill, and to our entire Congregation Or Ami community. Recently, Cantor Doug Cotler and I officiated at two different B’nai Mitzvah services of children with special needs. In each case, the parents were sure that their child would never read from Torah, lead the service or become a Bar Mitzvah. Like the few dozen other such families who thought the same, they were overwhelmed and blown away when their child led the service, read from Torah and gave a speech. There wasn’t a dry eye in the house! 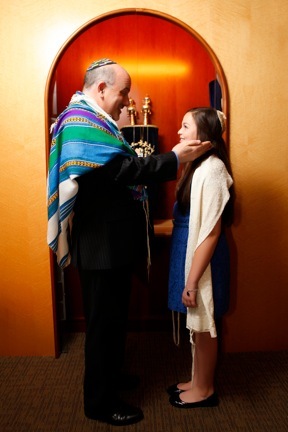 At Congregation Or Ami, we are committed to the idea that any child of a member who works to the best of his or her ability, has the privilege and right to a Jewish learning experience and to becoming a Bar/Bat Mitzvah. The children participate in a real service, just one that is subtly tailored to each child’s unique abilities (which, by the way, is basically what we do for EVERY child). Maybe he will read Torah but not Haftarah. Maybe he will sing the prayers he knows and explain others. Maybe his service will be before only 15-20 of the closest and then there will be a bigger party. Maybe he will only chant one verse of Torah per aliyah. Maybe his Torah portion will be the V’ahavta prayer, which he will already know by heart (the V’ahavta in the prayerbook, comes from the Torah). The creativity of our B’nai Mitzvah tutor Diane Townsend to figure out ways to get each child to do his/her best. Diane works with me to tailor the service in a way that outsiders would not realize is tailored, but makes your child shine brightly. The willingness of the parents to let go of their sense that it cannot happen, but instead to believe that yes, my son – just like every other Jewish boy – can become a Bar Mitzvah. By the way, I have NEVER encountered a child with special needs (at Congregation Or Ami or at my previous synagogues) who could not and did not become a Bar/Bat Mitzvah. I so look forward to celebrating as your son becomes a Bar Mitzvah. So don’t worry. We can talk more if you want. Gosh, I wish we could better publicize this message. I wish that all synagogues would realize that there should be NO barriers to children with special needs, especially with regard to Jewish ritual. Today is the 9th day of the Omer, that is one week and two days. We are on the journey still, to Mt. Sinai. When we arrive at the 49th/50th day, we experience Matan Torah, receiving the gift of Torah. Among the most distinguishing features of Torah are its imperatives to live an ethical life. We are commanded both to talk the talk, and walk the walk. In this week’s parasha, we read Kedoshim Tehiyu – You shall be holy. For Jews, holiness is not spirituality based on sitting on a mountaintop, meditating or doing yoga (although I, and many other Jews, do both). Rather being kadosh – holy in Judaism is to act in ethical ways toward one another. Well intentioned, yes, but how do we make this happen? At Congregation Or Ami, our nascent Center for Tikkun Olam (social action) hosts a Mitzvah Fair for our youngest students. The brainchild of congregant Debby Pattiz, the Mitzvah Fair gets kindergarten through 6th grade students thinking about how they can act ethically and live kadosh. Mitzvah projects can benefit children, the elderly, animals, the hungry, the environment, refugees, the poor, or any other group or cause that needs help. Despite so many people and places needing healing in our world, finding a mitzvah project that fits the individual interests and abilities of each pre-teen can prove challenging. That’s why Congregation Or Ami hosted its inaugural Mitzvah Project Fair on April 4 and 6 during its Kesher learning program. Or Ami teens who completed their mitzvah projects in the past year presented their volunteer projects to the younger children in the temple’s Religious School program. The presenters used posters and handouts and talked with curious first- through fifth-graders about their experiences. The younger children were amazed by the wide variety of projects. Some of the projects were training a seeing eye dog, teaching inner city children about managing money, sending handmade notes to military personnel posted overseas, playing with disabled children, caring for orphaned animals, and collecting food for the hungry and basic supplies for the homeless. “By doing a mitzvah project, you are being a super mensch,” (Yiddish for “a really good person”) said Oak Park resident Jonathan, a third-grader. In addition to showing the younger children the many handson projects they can accomplish, the Mitzvah Project Fair showcased the accomplishments of the temple’s teen members. “The Mitzvah Project Fair also provided an opportunity for our congregation to acknowledge the great pride we feel at the important work our teens are undertaking to ‘heal the world’ and to celebrate their acceptance of tikkun olam as a lifelong pursuit,” said Debby Pattiz, mitzvah project coordinator. May these days trekking through the wilderness provide you with plenty of time to think about how you can both talk the talk and walk the walk … of kadosh – holiness. I’m up in San Francisco for the Central Conference of American Rabbi’s convention. 460 Rabbis plus spouses/partners are together in the famed Fairmont Hotel for study, chevruta (friendship), social justice and prophetic pronouncements. Many are sharing the struggles of their communities as they make their way through the deep recession. Many talk about the infighting that has marked the challenges. I just listen, and kvell. Kvelling about a 13th year Bar Mitzvah celebration we just concluded, filled with an inspirational Friday night Bar Mitzvah service, a fun-filled Bar Mitzvah adult Gala party (few talking heads), and a Sunday morning kids party. I’m kvelling about the montage of 13 years of Or Ami. I’m kvelling about the great article in the Acorn about our sacred work. We all have struggles. I’m proud to be part of a community that scheps nachas along the way. Another reason why our Congregation Or Ami is so inspiring: our congregants share their love and joy, and speak about it regularly. You beat me to it. I was about to sit down to write a note to you expressing our appreciation for the beautiful service you and Cantor Cotler conducted on behalf of Ben and our family and friends. I thought that I would check my email first. And there it was, the special tribute to the love Marianne and I share with each other. Now it is a little difficult to continue writing as both our eyes are filled with tears. Thank you for sharing. We have been members of a congregation all of our married years – 53 years and counting. We have always believed that it was important to maintain an affiliation with a synagogue. We felt it was an obligation to our community and a responsibility, as parents, to share our tradition with our family. However, until our daughter Ellen introduced us to Congregation Or Ami, we never really enjoyed attending services. You are unique among rabbis and I can say the same about the Cantor. Prior to you, services were all about Abraham, Isaac, Jacob and Moses. You bring our religion into the real world, about today’s relationships with our family, our community and our world in ways we can all relate. The comments by members of our family, and our daughter Ellen and son-in-law Mark’s friends and neighbors relating to the way you and Cantor Cotler conducted the service were glowing with praise. Several couples stated to us that they were seriously thinking about joining the congregation. You have a great sensitivity to everyones’ needs. We have experienced the opening of the entire torah to the congregation with you before, and I am always fascinated with the length and the effort it takes to write it. It leaves quite an impression. We were very touched at the High Holy Day services when you called to the Bimah and thanked the non-Jewish parents for their permission and help to allow their children to be brought up in the Jewish tradition. In all the years of attending services we have never seen that done. Again, it brought tears to our eyes. In regards to Ben’s Bar Mitzvah. We appreciated your sensitivity in bringing our son-in-law Mark’s family into the service. We saw Ben in a different light. He has always been the jock in the family, filling our weekends with some sort of athletic event. Although he is really a good student, we did not expect the kind of commitment he made to study for his Bar Mitzvah ceremony. We were proud. Thank you for becoming part of our extended family. Our trip to Israel allowed us to enjoy a relationship with you, your wife, your father-in-law and your children. We relish and look fondly upon that experience. We were in the middle of the Baraghimian Bar Mitzvah. Child number three was doing a fabulous job leading the service. Parents were schepping nachas (filling with joy); friends and family were enjoying the experience. Having traveled to Israel with the whole family, including the grandparents, I knew the grandparents were a wonderful couple, unafraid to speak of and share their love. I recall walking down Masada, sharing stories of how we each got engaged. Now, during the Bar Mitzvah, as I looked over to where Grandpa and Grandma were sitting, I caught them in one of the sweetest Bar Mitzvah moments yet. Without taking his eyes off his grandson, Grandpa reached over, took Grandma’s hand and held on. Grandma wrapped her hand around his. All the while, their eyes never left their grandson. That’s love. It made my Shabbat! Our son recently became Bar Mitzvah at Congregation Or Ami and there is much for our family to reflect upon and even more to carry forward and cherish for a lifetime. The culmination of our preparations, deliberations, and expectations seemed to all focus on this one day that was so unique and fulfilling and that was magically orchestrated into a seemingly flawless service by Rabbi Paul Kipnes, Cantor Doug Cotler and Bar Mitzvah teacher Diane Townsend. Only on the evening of the rehearsal with Cantor Doug, about a week before the Bar Mitzvah did the full impact of our son’s learning with Diane become evident to us. Leading up to the Bar Mitzvah, we had enjoyed the muffled sound of his singing in the shower and the practicing of his Torah portion, but we never quite got to hear the real thing. We consider our son talented, but the rehearsal with Cantor Doug revealed a singing voice that we were completely unaware of. Diane had somehow managed to bring a dormant talent to the surface and our son seemed to revel in the joy of his own voice. What a gift! Yes, my wife and I shed tears at the rehearsal, and little did we know this was only the beginning. On the big day, Or Ami’s Calabasas, CA sanctuary, filled with our friends, family, and anxieties, transformed into a special place where our hopes, dreams and expectations were soon to be realized. Perhaps this same magic happens in all Temples, but Rabbi Paul, Cantor Doug and Diane are a very hard act to follow. Without hesitation, our son followed their cues and like clockwork, it all came together. It became obvious that our son had developed a very special bond with his teachers at Or Ami. Some said being in our Shabbat service was like being in a relaxing yoga class; some said the joy of the music overwhelmed them. Others said that it was the best service they had ever attended. All agreed the service was very beautifully different from their own Temples’ services. Something very special happened to me too on that day. The collective experience of bearing witness to my oldest son address the congregation, read from the Torah and basically conduct the service all by himself, made me aware of the role we parents play in passing down Jewish tradition, and how that role is supported by the inner workings of Congregation Or Ami. A strange but familiar feeling overcame me as the service came to an end, as if I had been here before, and I quickly realized that I was feeling the same feelings I had felt at my own Bar Mitzvah service. The sense of L’dor Vador, transmitting Torah from generation to generation. There we stood, Rabbi and three generations of the Tillis family, preparing to physically pass down the Torah midor lador (from generation to generation). This primarily Reform Movement tradition makes manifest what is happening in fact and deed: that another young adult is receiving Torah from his ancestors. At the end of this line of stood a young man Jared, who though he spent his life challenged by special needs and multiple treatments – a rare form of non-convulsive epilepsy, speech therapy, vision therapy, challenges reading and decoding – now stood ready to do what every other 13 year old boy does. Jared was becoming a Bar Mitzvah. I looked out at the crowd of family and friends. On their faces I saw utter amazement; reflected in their eyes was the wonder that this young man, in spite of all the challenges he faces, had led the prayer service so beautifully. 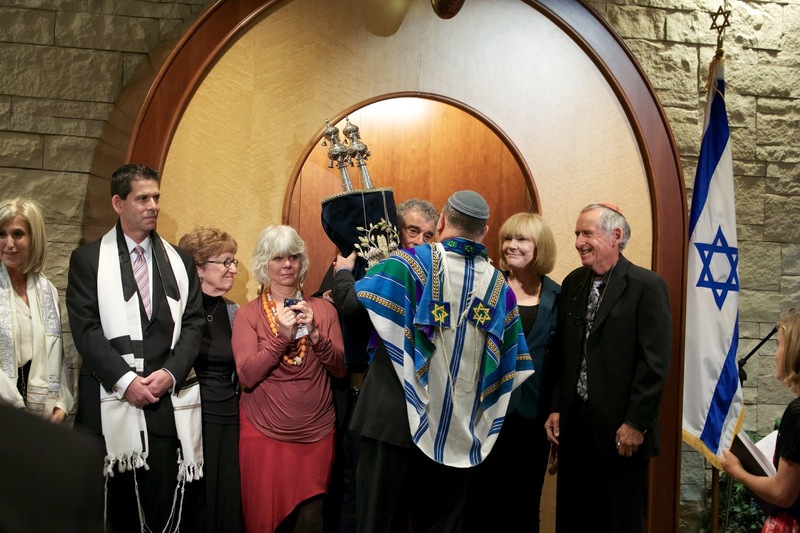 His Bar Mitzvah teacher, the incomparably talented Diane Townsend, had been by his side, pointing to each transliterated syllable so that he could chant the prayers at his own pace. Too see how creatively she had retransliterated each word in a way that it would be comprehensible to this specific Bar Mitzvah boy is to witness a master teacher at work. Yes, we had already each experienced that Shehecheyanu moment, that blessed happening that reminds us all that we were just touched by the miraculous. What words could I say which would further capture the holiness before us? And how to do it in such a way that everyone would understand on their own level: the Bar Mitzvah boy in his specifically special manner of comprehension and the guests who had been touched by the Transcendent? We are taught that Torah was revealed in 70 languages at once so that each person could comprehend it. Who is to say that which languages they were? Perhaps some were the language understood by a child with special needs. Maybe the simple concepts that a profoundly challenged child could comprehend. So I told them: We are taught that Torah was given to everyone at Mt. Sinai: the rich and the poor, the strong and the less strong, the healthy and the sick. Yes, even those who stuttered (Moses), were leprous (later, Miriam), or were beaten down by the challenges of their lives (all the Israelites) received the Holy Torah. I reminded them, lovingly, that sometimes we doubt who was able to receive Torah, but that as long as there are people who believe (I looked at Mom and Dad and older sister), everyone can grasp hold of the holy books. I said a bunch of other words too, but as I looked out at the congregation, seeing not a dry eye in the sanctuary, I started to choke up too, and mumbled something that I cannot remember anymore. Then we passed Torah down midor lador (from generation to generation) completing the cycle. That the Holy One of Blessing (God) blessed us this day by allowing each of us to experience the transcendent holiness of this Bar Mitzvah. …Shehecheyanu v’kiy’manu v’higee-anu lazman hazeh – Blessed are You, God … for giving us life, for keeping us in life, and for bringing us to this special moment. Congregation Or Ami exudes openness and welcoming of families with children with special needs. Read about it. Written by Michelle November and Paul Kipnes on a New Year’s road trip up north. Five years ago, at the request of our children’s paternal grandparents Papa and Lala, we took our 20%-off coupons to Bed, Bath and Beyond and purchased seven triffle bowls. At the time, we didn’t even know what a truffle was. But Papa and Lala were insistent that this dessert would be the biggest hit of all at our daughter’s Bat Mitzvah oneg (sweets) table. And they were right who could resist the eye-catching dessert, comprised of layers of cake, pudding, brickle (heath bar crunch), and whipped cream or the same with fruit. The clear glass bowls which showcased the delectible desserts survived two moves and months being lost in the far corners of the garage. Still, they made their appearance at the Bar/Bat mitzvah celebrations of each of our three children over five years. More significantly, the lasting power of these treats were that they were homemade for these special occasions by grandparents who reside on the other side of the country. Along with the triffles, came 850 pieces of home baked pastries. Enough pieces to satisfy the sweet tooths of each of the 245 people who attended the service, and still leaving plenty of leftovers. Each child selected his or her favorites from amongst Lala and Papa’s creations: brownies, seven layer cookies, apple strudle, chocolate or cherry rugelach, chocolate-covers chinese noodle “spiders,” and more. The crown jewel of the evening was the homemade challah, schlepped (lugged) through security on board the plane, all the way from Massachusetts. Cooking and baking are two of Papa and Lala’s most authentic expressions of love. This baking is all the more appreciated by our children because the baking gene seems to skip our generation on both sides. So our kids get love and sweets regularly from their Cape Cod grandparents. A sweater hand knitted by grandma might still look funny to the grandchild and they might not wear it But who can resist a sweet bowl of chocolate triffle and a piece of homemade fudge? And besides, the leftovers are delightful and no one complains when they are “forced” to eat a bowl of ice cream covered with crumpled brownies and pastries? Our cantor sings that at each moment we “are standing on the shoulders of the ones who come before me.” For us, we are grateful that the pastries and triffles will remain sweet memories of the intense involvement of this set of grandparents has in the lives of our children. We are grateful too that our children appreciate it. So that even with a mouthful of fudge, they feel the love and warmth of their Lala and Papa. Bar Mitzvah for child #3 went computerized. Not the Torah or Siddur (prayerbook), but just about everything else. We created an online invitation using a Create Your Own Website template (maybe sometime in the future we will post it here for all to see). We made an online donation to an Israeli Nature organization equal to what we had saved not printing invitation (and saving trees). We uploaded addresses and sent an online invitation to everyone we wanted to invite (at our son’s request, we sent my son’s friends a one page flyer, instructing them to go online to view the invitation and to RSVP). Truth be told, we might have missed a few older relatives who do not have email or computers. People RSVP’ed online (a feature of the website). We tracked who was coming with a computer program – Microsoft’s Excel. He drafted his d’var Torah (speech) on his computer and, using “track changes,” received edits and advice from his rabbi (my friend). We kept a list of who gave which gifts on the same computer program. Typed thank you notes also afforded us the opportunity to edit the notes easily. Very little copying and pasting really (though he did use a template he wrote and supplemented or changed from there). It was natural for him, personal for most recipients, and painless for us parents who had to make it happen. Miss Manners might frown on the typing and printing, but this kid types and prints everything else, why should his Bar Mitzvah experience be anachronistic? We printed the thank you notes out on Thank you cards. And he signed each one personally. Soon, we will review digital pictures as we read email (electronic) notes from friends kvelling about the service and celebration as our extended family Facebook’s the experience for posterity. So, Torah read from ancient scrolls, while the celebration and party was organized digitally. Old and new, combined. It felt natural to him and his generation. Why not?